Ladies and gentlemen, the next generation of Droid has entered the building. Well, almost. Verizon officially took the wraps off its Motorola Droid 2 Tuesday morning. 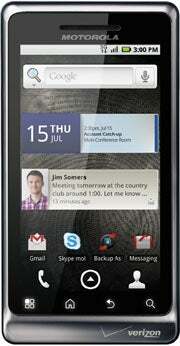 The Droid 2 is a direct successor to the original Motorola Droid, which debuted last November. It launches this Thursday, August 12, with presales beginning on the 11th. extends all the way to the bottom of the phone, whereas the original Droid's bevel was black and left a quarter-of-an-inch gap at the bottom. The Droid 2 also has a blueish tint to its back side, compared to its predecessor's solid black look. (You can get a closer look at the Droid 2's design at Verizon's 360-degree demo page.) Oh yeah -- and then there's that limited-edition, super-geeked-out R2-D2 edition of the Droid 2, too. That's pretty damn cool. The most significant differences, however, aren't about looks; they're about functionality. The Droid 2 has a completely redesigned keyboard with larger, raised keys and no directional pad. It also boasts a 1GHz processor and 512MB of RAM, giving it considerably more power than its older brother's 550MHz chip/256MB RAM combination. In terms of storage, the Droid 2 packs a respectable 8GB of internal space. 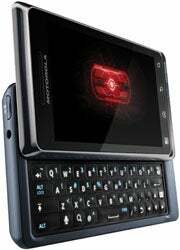 The original Motorola Droid, as those of us who own it know all too well, is limited to a relatively puny 256MB internally. The Droid 2 ships with Android 2.2 already preloaded with support for Adobe Flash. The first Droid, meanwhile, is in the midst of receiving its Android 2.2 upgrade right now, and it looks like it may be another few weeks before Flash support is enabled. Even within Froyo, the two phones have noticeably different flavors. The Droid 2 has the same customized user interface as Motorola's Droid X. It's essentially a toned-down version of Motoblur: It's less cluttered and intrusive, but the basic features -- the social network widgets and special navigation bar -- are still present. The Motorola Droid, in contrast, runs an unmodified version of the stock Android operating system. In all of the Droid 2 prelaunch discussion, one thing we didn't hear much about was battery life. According to Motorola, this is an area where the Droid has been dramatically improved. Motorola quotes an estimated talk time of 9.6 hours with the new Droid 2, compared to 6.4 hours with the earlier model. In standby, the Droid 2 is listed at 13.1 days; the first Droid gets 11.3. Finally, the Droid 2 -- like the Droid X -- includes support for Wi-Fi hotspot functionality. This feature can be activated for an extra $20 a month. The original Droid, due to apparent firmware limitations, does not have this option (though it can still be tethered via USB, with the right configuration). 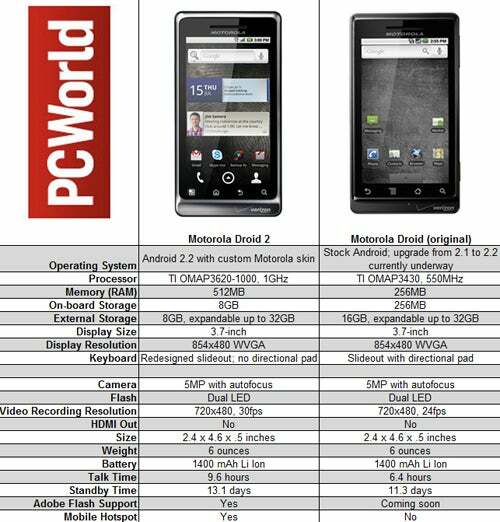 So there you have it: the tale of two Droids -- two very different phones with a lot of similarities. Let's just hope this story doesn't end in sibling rivalry.